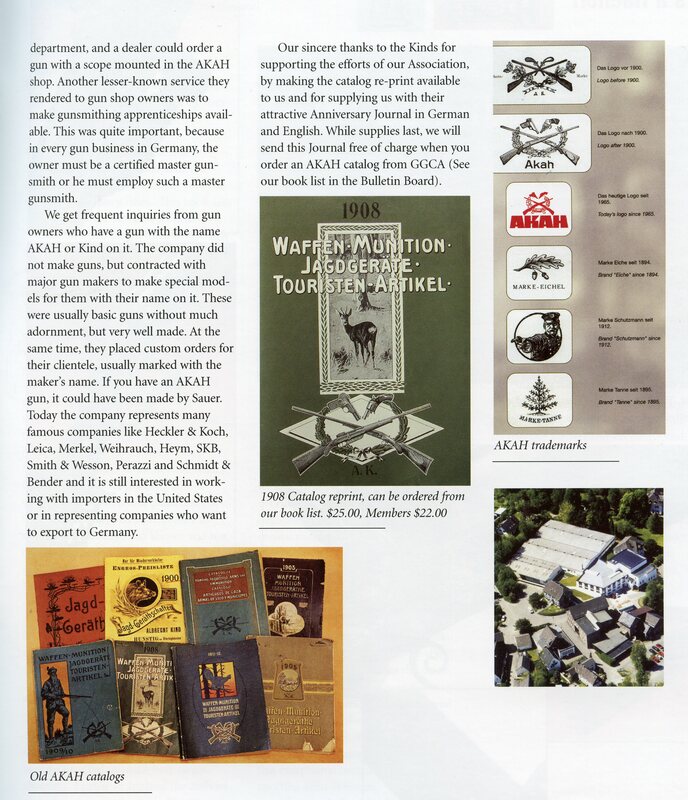 The German Gun Collectors Association has a Albrecht Kind catalog reprint available for purchase. Click Here to go to their site and to view thier offerings. This company was founded in 1853 and has been in the family and in the same location ever since. Originally the company was a supplier of everything the hunter, shooter and gunsmith needed. A manufacturing plant for leather goods for the hunter was added in 1865. At the end of the 19thcentury the company had branches in Nuernberg and Berlin in Germany as well as in Stockholm, Oslo, Konstantinopel, Sofia and Bukarest. They also exported to all European countries, to America, to the Middle East and the various colonies. They still manufacture best quality leather goods for the hunter and shooter. AKAH also manufactures their own Akah Scope Mounts for a great variety of guns. Many gunsmiths consider their German Claw Mounts to be the best available. The company also has a well equipped gun shop and always employs a full staff of gunsmiths. As wholesale distributors they not only supply everything a gun shop needs but they also work on the guns they sell and they train the next generations of gunsmiths in their shops. Over the years they represented most of the well known gunmakers of Germany and of other countries. They also had guns made to their specification by major gun companies, all marked with the name “Akah”. Among these were guns made by J.P. Sauer & Sohn. They have never manufactured guns themselves but had great influence over the gun markets. The company is still in existence, still manufactures leather goods and scope mounts and is still a wholesale distributor, importer and exporter. They are now the importer of Smith & Wesson guns for the European markets. 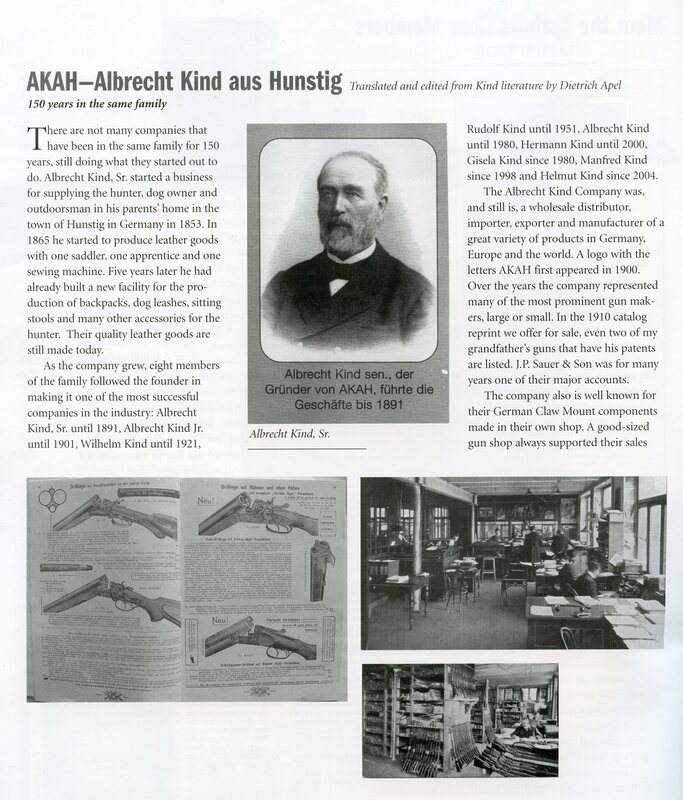 The reprint of a 1908 AKAH Catalog reprint with 130 pages you will find a great selection of guns and accessories available to the hunter and shooter at the time. It can be ordered from the GGCA .